PART 2: Nelson Denis on the U.S. Persecution of Puerto Rican Independence Leader Pedro Albizu Campos | Democracy Now! Watch our extended interview with Nelson Denis, author of “War Against All Puerto Ricans: Revolution and Terror in America’s Colony,” and see excerpts of Pedro Albizu Campos’ 1950 speech made shortly before he was arrested. We also speak with Rep. José Serrano, Democratic congressman from New York. He successfully pushed the FBI to declassify records regarding the Bureau’s activities targeting independence activists. He was born in Mayagüez, Puerto Rico. 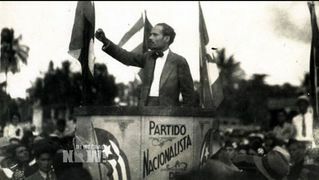 Albizu Campos, popularly known to many as Don Pedro, was the former head of the Nationalist Party and leader of the Puerto Rican independence movement. He spent some 26 years in prison for organizing against U.S. colonial rule. AMY GOODMAN: This is Democracy Now!, democracynow.org, The War and Peace Report. I’m Amy Goodman, with Juan González, on part two of our discussion on this 50th anniversary of the death of Pedro Albizu Campos, popularly known to many as Don Pedro, leader of the Puerto Rican independence movement. As we continue our special remembering his life, we turn to an excerpt of Pedro Albizu Campos speaking in 1950 shortly before he was arrested. PEDRO ALBIZU CAMPOS: [translated] Today we face a state in our country, in which the enemy—that is to say, the United States of North America—feels defeated by the right we earned in the American Commission of Dependent Territories. It feels defeated by the commission’s recognition that Puerto Rico is a nation under intervention by the power of the United States. The U.S. did not dare attend an inter-American conference for the first time in the history of America. Why? The U.S. had the right to a seat there and always has a right to a seat there on the American Commission of Dependent Territories. Why didn’t it attend? Because in its midst, by intrinsic right, Puerto Rican entities would also be attending. That’s the work of the Puerto Rican Nationalist Party, which in Bogotá secured direct participation for all those entities interested in the state of U.S. military intervention in Puerto Rico. So the Nationalist Party of Puerto Rico turned up with its Puerto Rican independence flag, not to clamor for the possibility of recognition we’re granted by positive law, by natural law, which we can demand anytime, but to demand recognition, because within the framework of positive international law Puerto Rico was a sovereign nation on the date of the drafting of the Treaty of Paris. And Spain could no more cede Puerto Rico than the United States could annex Puerto Rico, or than the entire world could negate Puerto Rican sovereignty, because the recognition of a nation’s sovereignty is irrevocable. And when the United States, with its artillery, obligated the Spanish plenipotentiaries to sign the so-called cession of Puerto Rico, like it was simply committing a holdup, of a sort that is typical of North Americans—and that coercion of Spanish will bore no legitimacy in Puerto Rico, because Puerto Rico is a sovereign nation. It had nothing to do with the Spanish-American War. It was never a belligerent party on behalf of the U.S. or anyone. And the Yankees have been here for over 52 years, waging war on the Puerto Rican nation. And they’ve never once acquired a right in Puerto Rico. There is no legal government in Puerto Rico, and that’s incontestable. You’d have to knock to pieces the entire framework of world law, of international law, to validate the U.S. invasion of Puerto Rico and the present military occupation of our national territory. And the Yankees can’t sit down at the table with jurists to demand of the jurists that they tell them that the present U.S. military intervention in Puerto Rico has any legitimacy at all. And that’s why they didn’t dare attend the Havana conference. They sabotaged it so it wouldn’t convene. They overthrew governments to keep them from attending. They intimidated the whole hemisphere, and it all failed. The commission met and resolved that Puerto Rico is a nation under intervention. Votes were cast so that Puerto Rico would have the opportunity to enter the society of the free peoples of the world. AMY GOODMAN: Puerto Rican independence leader Pedro Abizu Campos speaking in 1950. He died 50 years ago today. Still with us in part two of our conversation are two guests in New York. New York Congressmember José Serrano, who successfully pushed the FBI to declassify records regarding the FBI’s activities targeting independence activists, he was born in Mayagüez, Puerto Rico. And Nelson Denis is with us, author of the new book, War Against All Puerto Ricans: Revolution and Terror in America’s Colony. He’s a former New York state assemblyman, former editorial director of El Diario, the largest Spanish-language newspaper in New York City. The circumstances even of this speech that Don Pedro gave in 1950, can you explain, Nelson Denis? NELSON DENIS: Well, there is the courage and leadership of this man. As we discussed previously, there was La Ley de La Mordaza, the law of the muzzle, Public Law 53, which was modeled after the 1948 anti-Communist Smith Act. But in Puerto Rico, it was applied just to suppress nationalism or any talk of independence. If you breathe one word about independence, under that law, you can go to jail for 10 years. Well, this speech was delivered in the jaws of the lion. He had an agent, an FBI agent named Jack West, whose job it was to have—create newsreel footage of every speech that he gave all over the island. It was being transcribed and recorded everywhere he went. So when he gave this speech, he was practically daring the American empire to arrest him. He was playing brinkmanship with his own leadership in order to inspire the entire island. JUAN GONZÁLEZ: And when you talk about the persecution of him, in your book you also quote from his wife, Laura, who he met when he was at Harvard, about the attacks on their house, very similar to the attacks that occurred against Malcolm X. And she talks about numerous attacks that she believes the FBI were behind on their home. NELSON DENIS: It happened in Aguas Buenas. It happened in Ponce. And that was one of the reasons why he developed the Cadets of the Liberating Republic, Los Cadetes de la República. It was a youth arm of the Nationalist Party, but they were also stationed as bodyguards around Albizu Campos. And that is how I came to know some of this, in addition to the FBI reports, was that one of my—Juan José Cuadrado [phon.] was one of those bodyguards, and that’s how I came to know some of this information over the years. But the hostility was continuous. And the FBI hounded this man to every corner of the island. Anyone that even spoke with him was immediately debriefed, meaning interrogated, by the FBI. And it could be a felony just to talk to Albizu Campos. REP. JOSÉ SERRANO: Yeah, and where the FBI was very successful, as you know, Juan, was that it criminalized the independence movement. The independence movement, prior to that act, that behavior by the FBI, was a legitimate political movement that actually ran candidates. And it reached the point where its percentage began to get high, and then it was turned, because in one of the first page—one of the first reports on Albizu Campos says he could win the next election, his party could make great gains in the next election. Well, that’s the American way. And yet they painted it as such a negative thing that they criminalized the whole movement. JUAN GONZÁLEZ: Nelson, I wanted to ask you about some of the criticism of Albizu. I’m sure in your research you came across it. There was this book by Luis Ferrao, which came out in the early '90s, which also raises issues of the negative aspects of the nationalist movement under Albizu, the fact that there were some neo-fascist tendencies, according to Ferrao, that Albizu was a backer of Franco during—the civil war in Spain became a huge issue even among Puerto Rican Nationalists, with some members of the Nationalist Party siding with the Republicans against the Falangists, and that—and also that Albizu also was a staunch defender of Trujillo, the dictator of the Dominican Republic, even after the massacre of Haitians in—the massacre of thousands of Haitians in 1937. I'm wondering if in your research you came across some of those issues, as well. NELSON DENIS: Well, there’s a term in the law called habeas corpus, and it simply means “produce the body.” So, this is another instance of George Orwell being alive and well in the history of Puerto Rico and in the footprints of history, because where is this evidence of his being a fascist? If you have a law, a gag law, that says that—that totally abrogates the First Amendment rights of everyone on that island in order to shut one man up, who’s the fascist? If you have police dossiers on 100,000 Puerto Ricans, that they don’t even know about and that could destroy their families, their careers, their reputations, who’s the fascist? If you have two towns that are bombed in broad daylight and 3,000 Puerto Ricans arrested within the space of the week, who’s the fascist? So, all I can say is, you know, you can—that game, you could get away with it before, but unfortunately now, the cat is out of the bag, and it’s called truth. And the truth—and I commend Congressman José Serrano, who brought this information, is in those FBI documents. They unwittingly became the Boswell of Puerto Rican history, because now it is out. All we have to do is connect the dots of that history, and we can see the calumny and the—just the outright inversion of history. But now, history is being written by the people who lived it, the Nationalists themselves. And I thank the congressman for making that possible. AMY GOODMAN: Congressmember Serrano, you work in the House of Representatives. That’s the place where you can still see bullet holes from the 1954 shooting that took place. Explain who was involved with that. AMY GOODMAN: To shoot into the air? REP. JOSÉ SERRANO: Yeah, that’s marble. And so it ricochets off of that. But I don’t think that anyone ever admitted or it was said that they intended to hurt anyone. They wanted to make a point. AMY GOODMAN: Nelson Denis, explain the circumstances around that, just for people to have that image of what took place, and the circumstances in Puerto Rico right before. NELSON DENIS: Well, at that point, I have a theory, which I have to be careful about, but I noticed that the net result of all of it was that Albizu Campos was simply put back in jail. And that Drew Pearson interview that we saw earlier, Drew Pearson afterwards said, himself—he faced the camera, and he said that the FBI and Secret Service knew about this potential plot to the attack on Congress, but they didn’t do anything about it. It is my belief that there was an inner circle working that actually wanted this to happen, so that they would have an excuse for jailing Albizu Campos all over again, because Albizu Campos had nothing to—he didn’t issue the order for that to happen. That happened independently from New York. There was a lot of frustration. There was a sense, again, that the plebiscite had made Puerto Rico a commonwealth, but that it was actually a cover for a colony. But what I noticed was that no real—there was no real result. Nothing changed between the United States and Puerto Rico, except that Albizu Campos, who had been pardoned for just a few months, went back into jail. And they could not prove, therefore, that he was being radiated, because he no longer had access to the doctors in order to prove it. JUAN GONZÁLEZ: I wanted to go back to Albizu’s first arrest, in 1936, and when—on seditious conspiracy. There were actually two trials. JUAN GONZÁLEZ: There was one trial first that was a hung jury, a trial where the jurors were seven Puerto Ricans and five Americans, on the federal district court in San Juan. Then there was a second trial, and your book talks about how the second jury was rigged. JUAN GONZÁLEZ: Before the interviews of the jurors actually occur. NELSON DENIS: Before the voir dire, yeah. And so, I mean, what—same set of facts, completely different result. And it was—to tie that into a larger history, while he was still in jail in Puerto Rico awaiting the appeal, because he ultimately lost the appeal and went to Atlanta penitentiary, that was when the Ponce massacre occurred, because that was a peaceful march in favor of Albizu Campos, who was still on Puerto Rico. And so, to link those two, when they marched in favor of Albizu Campos’s freedom is when they slaughtered the 17 Puerto Ricans in the Ponce massacre. REP. JOSÉ SERRANO: Yeah, ironically—and this is something that you singled out to me when you read those files in my Washington office—no one can deny, sadly, as great as he might have been, that Luis Muñoz Marín played a major role in sort of making life miserable for Albizu Campos. And yet he didn’t know, himself, as the files show, that under that period of time he was under watch by the FBI—his personal life, his drinking style, what songs he liked, where he went, who he went with. It was all being watched, while he, himself, was playing a role, supposedly, in helping them watch the other guy. AMY GOODMAN: This is the 50th anniversary of the death of Pedro Albizu Campos. How did he die, Nelson Denis? NELSON DENIS: He died as a hero. It was tragic, because he underwent a cerebral thrombosis while in prison, that was brought on—and it’s pretty clear there was a direct causal relationship between the years of the radiation and the blood pressure and his declining health. It is documented in the FBI reports that the congressman got released and that I read. There’s hundreds of pages with medical reports showing his declining health. When he had that thrombosis, which is essentially a stroke, he wasn’t taken to—he didn’t receive any medical care for 48 hours. When a person has a stroke, you rush them to the hospital. The fact that he was under the dominion and control of the U.S. government, essentially, and they waited while this man had a stroke to take him to the hospital shows the hostility, the environment that he was in. AMY GOODMAN: From the prison to the hospital. NELSON DENIS: From the prison to the hospital. He then—because of that, he was semiparalytic and mute. He couldn’t speak, which is exactly what they wanted. And he couldn’t move on his right side. And this was as of 1957. He spent the next seven-and-a-half years still in jail, and then they finally released him when it was clear that he was at death’s door. And it really didn’t behoove the authorities to have him die in jail, because then he will be a complete martyr. So they let him go—well, “let him go.” He was—you know, he couldn’t even walk at that point. And the FBI files show that his phone was tapped, that they were following him, even under those conditions, because they were concerned that he would instigate, somehow, yet another revolution. So, when he passed away, 70,000 Puerto Ricans lined the streets of San Juan. They had black little ribbons all over the streets in Old San Juan. And he was a given a hero’s farewell. But it will always be remembered that he was a lonely voice that was never heard, and he’s only now starting to get his due. AMY GOODMAN: Yes, Congressmember Serrano? REP. JOSÉ SERRANO: Well, you know, it’s ironic and sad here that we continue to ask the FBI to release the files on what happened to him in prison. And it was not that difficult to get the ones that you so kindly speak about, but these other ones are totally gone. We also want to know about the son of Juan Mari Brás, who was an independence leader whose son was killed. And to this day, we don’t know who killed him or for what. REP. JOSÉ SERRANO: In Puerto Rico. And for what? And then there’s the last one, which was a gentleman who used to—and it’s ironic that we talk about it now—but is a gentleman who used to provide trips to Cuba, and he was killed. I believe his last name was Varela. And he was killed. And these are unsolved mysteries that the FBI has information on, but it won’t release to us. AMY GOODMAN: Well, speaking of hearing Pedro Albizu Campos’s voice, we’re going to end with the voice of the Puerto Rican independence leader, Pedro Albizu Campos. PEDRO ALBIZU CAMPOS: [translated] No one dares talk about it, but there’s more. An eminent Yankee physician, Dr. Filger [phon., has said that Puerto Rico is sitting on a powder keg. It’s not Albizu Campos saying that; it’s Dr. Filger, brought here for the insular government. I’m going to tell you a secret that’s not so secret: The United States has converted Puerto Rico into an atomic base. And the United States has in Puerto Rico, under the direct administration of the U.S. Army, a vast research facility for germ warfare, for bacteriological warfare. One of those laboratories is behind the capital, looking out to sea. That laboratory is experimenting with every single contagious disease on Earth. They’re experimenting in that laboratory with a disease that’s endemic to high plateaus of the Rocky Mountains. It’s a terrible fever. Why don’t they experiment with it in the area to which it’s endemic? Why bring those viruses, those germs, from that disease to Puerto Rico to experiment with it? Well, it might spread over there. And if it spreads here, then it’s just Puerto Ricans. What’s the difference? They killed a few in Korea. After the next atomic war, there might not be any left. What’s the difference? That laboratory in on the main artery coming into San Juan. That’s where they had the cages with animals in them that say “infected animals.” There are infected animals there—horses, cows, chickens, rabbits, rats. Any bit of froth from one of those animals might fall in the dust, and the dust flies off, and any person traveling on an open bus could absorb it and transmit it to the rest of the population. Has the Legislature said anything about that? No, no, no. They’re willing to burn up their whole country, as long as they can enjoy their privileges. You might say, “No, it’s great scientific research.” My friends, it’s under the direct command of the U.S. Army. No army is a charitable institution. Armies are made for killing. And this is under the command of a U.S. army. The U.S. Army Medical Corps, which they call the Yankee hospital services, hasn’t dared take charge of the research, because they don’t want to be discredited as physicians. The School of Tropical Medicine hasn’t dared to take charge of the research in Puerto Rico. So I invite the defenders of the Yankee flag in Puerto Rico to study that ongoing infection that’s flying over their motherland. There’s more still. That constitution is already written. Everything is written, because the master never trusts the slaves. No, the slave is always alone, apart. He knows that when the sun comes out, he disappears into the sun; when there are shadows, he disappears into the shadows. The master never trusts the slave. The master trusts his free enemy, because if that enemy is a free man, he says to his face, “Listen here. You’ve come this far. You agree with me to go that far. And we both respect that border.” And he signs a treaty with the free man and respects him, because that man is free. But a slave signs his name, and his name is worth nothing. That constitution they’re going to make the Puerto Ricans draft in '52 is already written. Why? Because when Puerto Ricans, or, better said, the voters here, draft a constitution, it doesn't become the law. No, because if they’re slaves, then the constitution isn’t that of a free country. Constituents draft a constitution and approve it, promulgate it. It becomes the law of the land. No, none of that. This is going to have to be approved by the president of the United States first. The president has to say it’s fine. He has to determine it. The president has to approve it. And if he approves it, then comes Congress. Why all this anxiety over an illusion, something that will sign Puerto Rico over to despotism? Well, that must be defied. And it must only be defied the way the men of Lares defy despotism: with a revolution. AMY GOODMAN: That’s Pedro Albizu Campos, the Puerto Rican independence leader. He died 50 years ago today, April 21st, 1965. I want to thank Nelson Denis, writer, film director, former New York state assemblyman. His new book is War Against All Puerto Ricans: Revolution and Terror in America’s Colony. And, of course, New York Congressmember José Serrano. And also congratulations on the hundredth anniversary of Frank Sinatra’s birth. REP. JOSÉ SERRANO: Yes, thank you. It’s a year-long celebration. AMY GOODMAN: Great lover of Frank Sinatra. This is Democracy Now!, democracynow.org, The War and Peace Report. I’m Amy Goodman, with Juan González.